1. In the Start menu, choose Computer. This will open the Computer window displaying all of your drives. 2. In the Computer window, click the "Map network drive" link on the toolbar to open the Map Network Drive dialog box. 3. 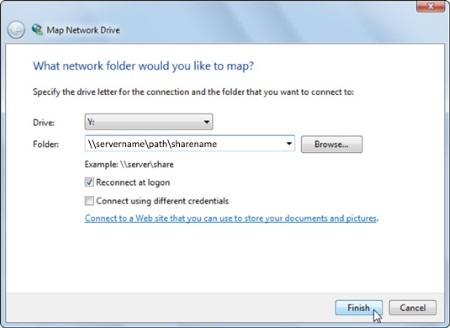 In the Map Network Drive dialog box, in the Drive drop-down list, select an unused drive letter for the network share. In the Folder text box, click on the [Browse] button and locate the shared network folder, or enter the network share's pathname. Then click on the [OK] button. If you're not an administrator, you may need to provide login information. Check with your network administrator if you don't know the username and password. Check the box labeled "Connect using different credentials" and enter the login information. 4. Check the "Reconnect at Logon" check box to tell Windows to map to this network folder every time you start the computer. • If you check "Reconnect at Logon", the computer with the shared folder must start up before the computer with the mapped share or you'll get an error message that the connection is not available. 5. Click on the [Finish] button. Now you will be able to access the shared network drive and open it in Windows Explorer. The shared folder will also appear in the Open dialog boxe's Navigation pane of most programs. Windows 7 For Dummies Quick Reference covers all the information you need most often: tips on navigating the new desktop, launching programs, working with files and folders, getting online and managing e-mail, using special features, and much more. It provides quick, easy-to-find answers that can save you time and hassle every day.